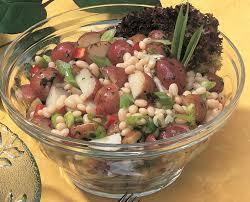 Ontario white beans, also known as navy beans, are high-protein, high-fibre, low fat and cholesterol-free. Beans are gluten free and contain impressive amounts of B vitamins, potassium, phosphorous, magnesium and calcium. 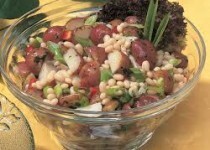 1) Cover white beans with water and soak overnight. Drain, cover with fresh water and simmer 20-30 minutes, until tender but not split. 2) Cook the potatoes in a pot of salted water until tender. Drain and let cool.When potatoes are cool, cut in quarters and place in a large bowl. 4)Toss the salad with the dressing. Garnish with chopped parsley or Spring Garlic Greens.